You've probably noticed how the dry, cold air of winter plays havoc on our skin, hair, and lips. We suffer chapped and peeling lips and skin, and dry, static-y hair. 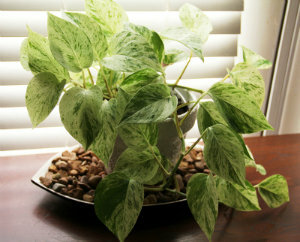 Our house plants suffer from the dry air in our houses, as well. Read on for some simple ideas to add humidity to your house and offer relief for the people and plants alike! When you search out ways to add humidity to dry household or office air, one of the most obvious solutions is to purchase a humidifier. If cost is no factor, a whole-house humidifier can be attached to a household furnace, to add moisture to the air that is blown throughout the house. On a smaller scale, there are many single-room humidifiers that must be filled daily, which add humidity. I have one that I run in the kitchen, which cycles on and off to keep the humidity in the room at a constant level. It does require daily filling, but I really notice the difference if I neglect it for a few days. I recently moved my beloved Christmas cactus from a chilly enclosed porch to the kitchen, where the humidifer is located, and was pleased to see it green up and look happier within a week. I'm sure the increase in temperature did it good, but can't discount the benefit of the increased humidity of its new location beside the humidifier! As a frugal gardener, I like to look for less expensive ways to achieve the my goals. One of the simplest ways to add humidity to the house is to reduce the use of vent fans in the bathrooms and kitchen. When you shower or bathe, refrain from turning on the overhead fan. Your mirrors may fog over temporarily, but if you open the bathroom door afterward (or shower with the door open, if you're home alone), you allow that precious moisture to dissipate into the air instead of blowing it outdoors. Likewise, if you are boiling water or soup on the stovetop, don't turn on that vent fan! If you have a sunny window in your bathroom or over your kitchen sink, you can arrange potted or hanging plants where they will directly benefit from the humidity and steam. Just be aware of how much light your respective houseplants need, and choose ones that are compatible with the light levels in your location! There are several very simple, manual ways you can add humidity specifically to your plants, as well. 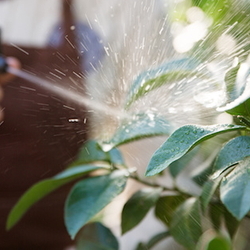 Plants without fuzzy leaves often benefit from a light misting of water from a spray bottle. If you have a lot of plants, and they've gotten dry and dusty from the forced air heat during the winter, you can even place them in the shower and give them a rinse. Just be sure to allow plenty of time for them to drain before you try to move them, or you'll be cleaning up a trail of dribbled water all the way back to their usual location. Grouping plants close together also helps to retain moisture. If you have very large potted plants, you can even set smaller pots on any bare spots in the potting mix, giving you many options to combine colors, shapes, and sizes in a pleasing arrangement without repotting or making any permanent changes. 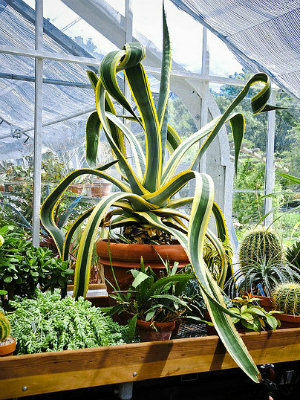 There are a couple of ways to add humidity to your plants right in their usual location. One is a humidity tray, which looks like a plastic grid. If you look closely, you can see one in the picture to the right under the grouped plants. Simply set it under your potted plants, and fill the grids with water. It also serves as an overflow tray when watering potted plants with drainage holes. The plastic grid of the humidity tray prevents the pot from sitting in standing water, as it would with a flat pan or drainage tray under it. 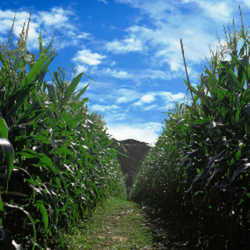 As the water evaporates, it adds moisture to the air around the surrounding plants. A simple, attractive option is to add a layer of decorative rocks, sand, aquarium gravel, shells, or glass globules (often used in floral arrangement) to a deep pan or drainage tray. Fill the tray to a depth of at least an inch, and then add water to just below the surface of the rocks or sand. Set your potted plants on top, so they will benefit from the evaporating water, without standing in a puddle of water. The idea is to avoid root rot, which occurs when the roots are exposed to continuous moisture over a long period, while allowing the gradual evaporation of water to provide additional moisture to the leaves and the room in general. This is a perfect opportunity to get creative with what you have on hand. 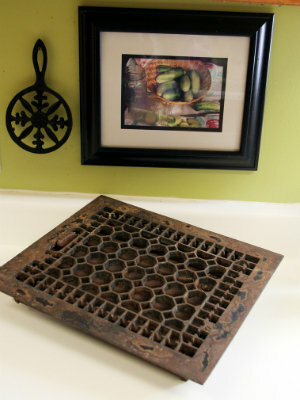 Dave's Garden member Melody Rose (melody) suggested a decorative heating vent grating set into a drainage tray would serve the same purpose, holding the potted plant above the standing water in the drainage tray. Another Dave's Garden member, Jill Nicolaus (critterologist) suggested cutting the plastic grids intended to cover fluorescent ceiling lights to fit into your drainage trays or dishes. Put on your thinking caps and consider what other materials you have on hand that could elevate your pots slightly! If cost is not a limiting factor, an indoor water fountain can add both humidity and the relaxing sound of cascading water to your home. There are many tabletop models that gently bubble and recirculate the water. 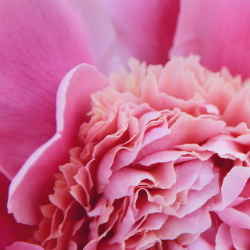 Simply locate one near your plants, and you can both relax and breathe deeply. You'll find that there is a wide disparity in moisture level from room to room within your house. The warmest rooms in your home are also likely to be the driest, as forced air heat tends to be very dry. Find a cooler location for your plants, or lower your thermostat by a few degrees to retain what humidity you already naturally have. 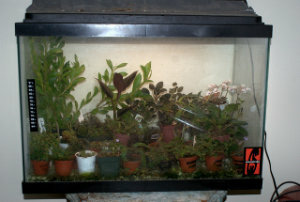 For smaller plants, a terrarium is an option. A large aquarium can provide everything a house plant needs: several inches of gravel in the bottom would elevate the pots above any water that drains away, while the lidded aquarium helps retain the moisture and keep the plants at a higher humidity level than the household in general. You can even put the aquarium lights on a timer to provide the optimal number of hours of light, which is difficult to achieve by setting houseplants near windows during the shorter daylight hours in winter. Even without an aquarium, an enclosed terrarium is an attractive way to reduce the frequency of watering and keep humidity levels higher. The possibilities are endless, with many containers designed specifically for use as terrariums, and a multitude of other vases and glass containers that can be repurposed as terrariums. Thumbnail image of potted plant: Flickr Creative Commons, submitted by TheSpaceQueen87. Some rights reserved. 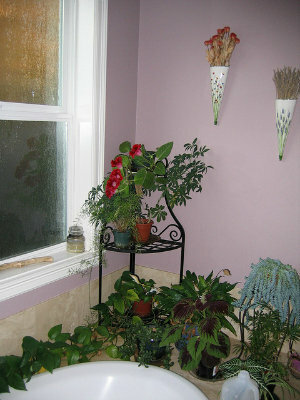 Plants arranged around bathtub: Flickr Creative Commons, submitted by John Hedtke. Some rights reserved. Grouped plants in greenhouse: Flickr Creative Commons, submitted by Valerie Everett. Some rights reserved. Decorative floor vent: Melody Rose (DG member melody). All rights reserved. Potted plant with rocks in drainage tray: Melody Rose (DG member melody). All rights reserved. 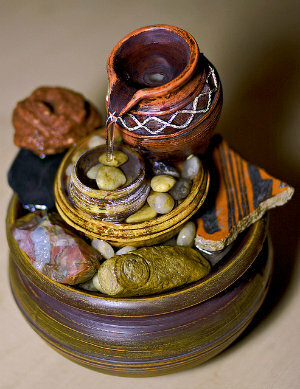 Decorative tabletop fountain: Flickr Creative Commons, submitted by Cobal123. Some rights reserved. Aquarium terrarium: Flickr Creative Commons, submitted by Olaf. Some rights reserved. 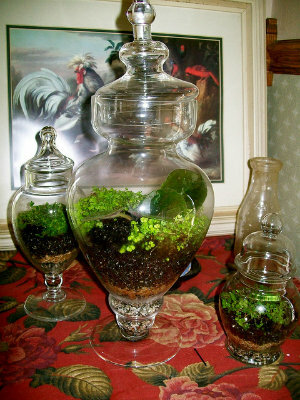 Terrarium arrangements: Flickr Creative Commons, submitted by Rachel Fisher (LadyDayDream). Some rights reserved.